A cartwheel gets its name from the motion that your body undergoes when you perform one. You make a full rotation from a standing position to an inverted one and back again as if you were affixed to a wheel. 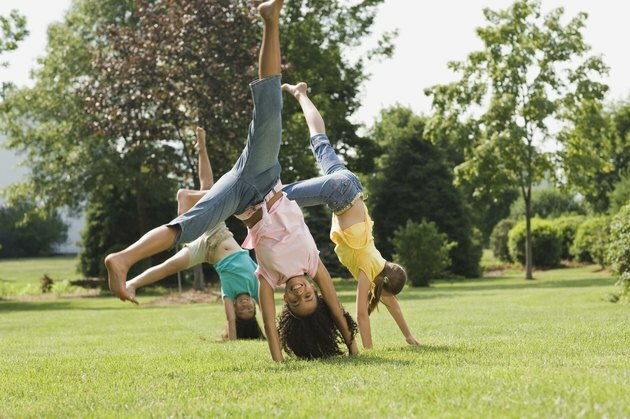 One of the fundamental moves in gymnastics and tumbling, the cartwheel is a step up from somersaults and handstands. A true cartwheel takes place on one plane of motion. From a standing position, you lean forward into a lunge, placing one hand on the floor as your feet leave the ground. Once you launch your feet from the floor, your other hand goes down to provide a stable base as your legs swing into a splayed vertical position. "Hand, hand, foot, foot" is a phrase gymnastics instructors sometimes use to describe the rhythm of a cartwheel. Your arms must be strong enough to hold your body weight aloft for the brief period of time you'll be on them, so beginners should attempt a handstand and become comfortable with supporting themselves on their hands. You don't need to hold the handstand for long -- a cartwheel relies on momentum as well as muscle power to spin your legs around -- but supporting yourself is vital to proper form and injury prevention. If you can't yet hold a handstand against a wall, work your way up to it with weights or practice. When you're able to maintain a handstand for a few seconds, practice the rhythm of a cartwheel without worrying about keeping your legs in a straight plane with your body, focusing only on placing your hands as you swing your legs around. If your hands and arms can hold you in an inverted position, you're ready to work on maintaining proper form with your legs. Because your movement through the cartwheel is in a single plane, your legs must go vertical at some point. That requires momentum to pivot your lower body around your center of motion, so you must move quickly enough to allow that momentum to carry your legs over your torso. Beginners and younger children may find the rapid motion of a cartwheel intimidating, but practicing with shorter arcs that carry the legs at an oblique angle helps prepare for the faster, fully extended version. Body awareness contributes to better cartwheel form. Visualizing yourself through every step of the movement gives you a better understanding of how you move through the cartwheel. You can also employ visualization to teach yourself or a child the finer points of form during a cartwheel. The name itself is a source of inspiration; think of your four limbs as spokes on a wheel, fully extended and arrayed on one plane of motion. Gymnastics instructors may tell younger students to reach for the ceiling with their toes when they perform a cartwheel to remind them to keep their legs straight. A combination of visualization and practice can improve your cartwheel technique.